I pulled into Sonic and there was a line. A LONG line. Ugh. I REFUSE to go to the “drive-in” stalls there. Why? Because I think it’s ridiculous to tip for fast food. I know that makes me sound super-cheap. But, come on, all they do is walk your food to your car when they could just as easily run a drive-thru. Luckily some Sonics are putting in a drive through. And now I only go to those locations. I know Sonic employees are paid minimum wage and don’t need to be tipped any more than, say, the dude giving you your food at McDonald’s, but there’s a stigma that you’re a cheap a-hole if you don’t tip there. I know, I know, I’m tangenting. My point is: if I didn’t feel like I had to tip, I’d go their waaaaay more often for Ched ‘R’ Peppers. But I guess this deterrent is good, considering the status of my waistline! Why do they call them Ched ‘R’ Peppers anyway? Weird. OK, back to the situation at hand. I’m sitting in the drive thru. She offers me salsa. I accept, pleased. See, this is the difference between Sonic and McDonald’s. McDonald’s trains their employees to be stingy mo-fos. Sonic wants you to enjoy your meal. Yes, I will take two packets. Thank you for asking! Alright, onto the review. I promise I’m not trying to stall. At first it looks like any other Sonic burrito. I AM a fan of the SuperSonic Breakfast Burrito (but not the commercials). 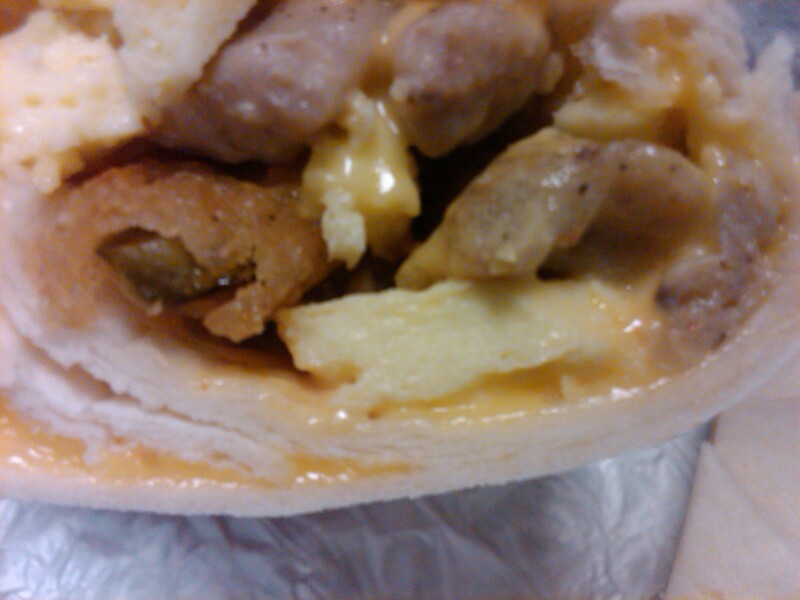 With its eggs, sausage, tots, cheese and jalapenos. How can you go wrong? Plus, dipping it in the aforementioned salsa. Can I get a jar of this stuff? For posterity’s sake, I cut the burrito open. Well, and because I wanted to see what I was eating before I ate it. Sometimes burritos are a mystery. And these burritos are meant to be eaten with your hands (I think). So I cut it open…. OK, so this looks all kinds of melty, cheesy, crunchy, sausage-y delicious. I need to eat. Please excuse me while I inhale. Bad news, folks. It wasn’t amazing. The crispy jalapeno strips were, um, not crispy, and were especially tough when you hit one, not a good contrast to the relatively otherwise soft burrito. And the chipotle sauce? It wasn’t great. I know Karla and Kendra said this stuff was amazing on that one burger topped with Ched ‘R’ Peppers. But in this case, it was gross. But the biggest problem was the whole thing was really salty. I could definitely see this being a hit with people who like saltier foods. But for me, I’d rather have a Sausage McMuffin with Egg. Or, if I’m going for the calorie gusto, a SuperSonic Breakfast Burrito. What’s the calorie count? 700. This compares to an Egg McMuffin at 300 (so you could have 2 of those, and 100 calories worth of non-diet Coke). Or a Sausage McMuffin with Egg at 450 calories and save the other 250 calories for… I don’t know? Three Ched ‘R’ Peppers later? Or a SuperSonic Breakfast Burrito, which weighs in at 570 calories. Bottom line: Not worth it for the calories. Well, and simply because it was too salty. And the tough jalapeno crispy thingies. And the sauce. OK, because the whole thing wasn’t great. I’m glad I have my Diet Coke with cherry and vanilla, though. 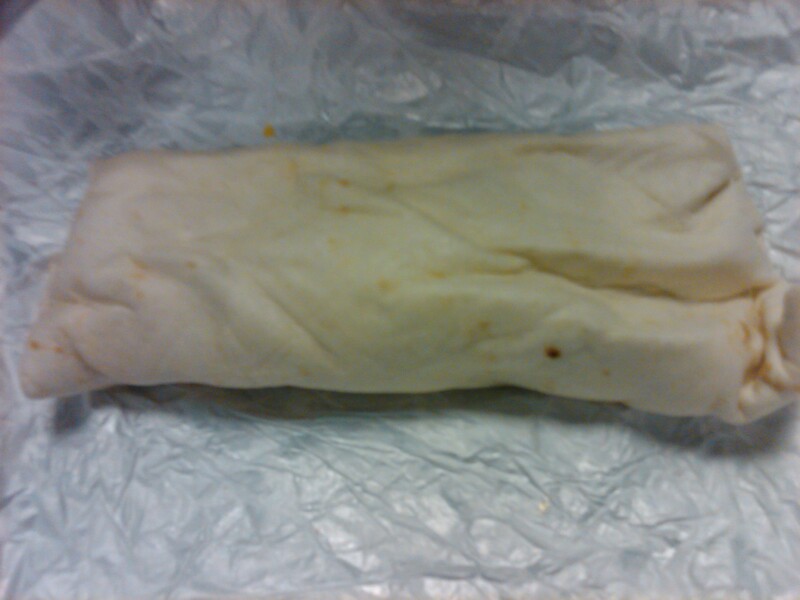 Or maybe you could do a regular burrito or Supersonic burrito + the SW sauce? I agree with Kim, the salsa is all I need. But I do like the tots in my burrito. Even though I know I shouldn’t. But let’s be honest, I shouldn’t be eating a burrito at all! Yeah, this does not even really sound good to me.. My FAVORITE burrito from Sonic is their supersonic breakfast burrito minus the tots (add salsa). YUM! For some reason I just can’t do the whole tots thing in a burrito, I hate it. But, you seriously can’t go wrong with sausage, cheese, tomatoes and jalapenos! YUM! Oh and for the record I NEVER tipped Sonic people because I always felt like they never really did anything that warranted the extra tip (sorry if I’m cheap too). If I wanted to tip I would be sitting down at a restaurant, not going to a fast food establishment. I don’t tip at restaurants when I’m just carrying out, same difference I figure!